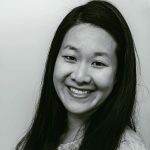 Published Dec 14, 2017 By Julia 5 CommentsThis post may contain affiliate links. 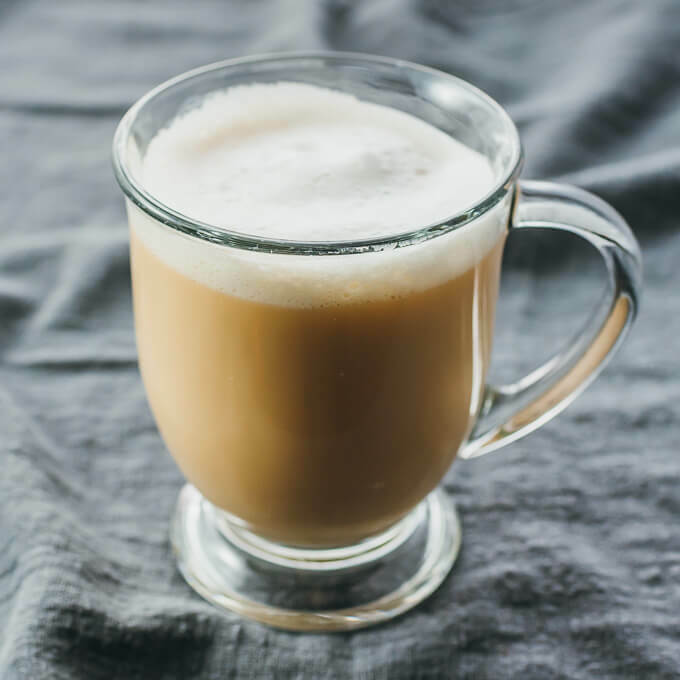 Skip the Starbucks run and make this London Fog drink (Earl Grey tea latte) at home — no espresso machine or special equipment needed. Low carb, keto, gluten free, vegan, paleo, and everything under the sun. 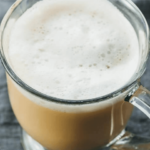 London Fog is an Earl Grey tea latte, concocted in this recipe using Earl Grey tea, vanilla almond milk, vanilla extract, and a low carb sweetener. While this drink is “light” in many ways, most notably in calories and carbs, it has a rich and decadent taste. The almond milk lends a smoothness to the drink and enhances the vanilla flavors. If you’re looking for a hot cozy drink to wake you up in the mornings with barely a trace of calories or carbs, then London Fog is the drink for you. 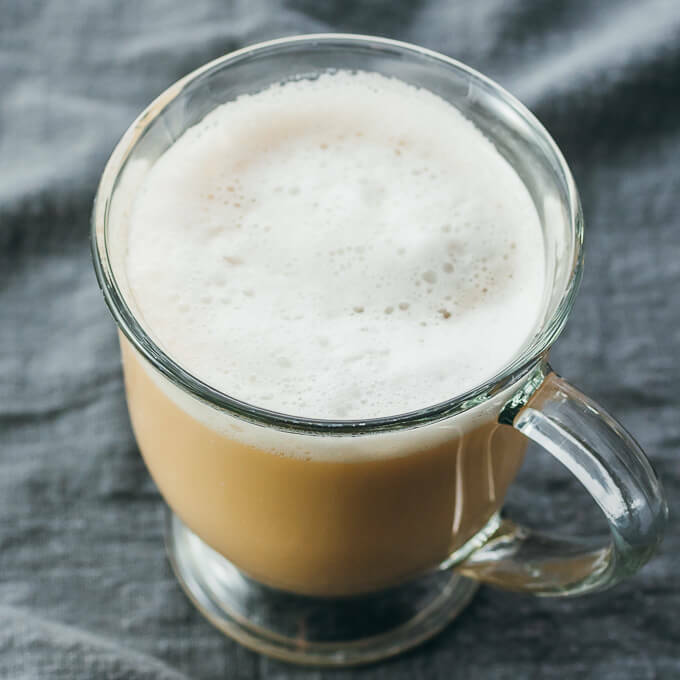 I’ve been frequently making this tea latte during the past few weeks (alternating it with Low Carb Hot Chocolate or Low Carb Eggnog), preferring it over coffee varieties like lattes and cappuccinos, and it only takes a few minutes to whip up. I use my espresso machine’s frother attachment to steam and froth the almond milk, but you can easily do so without a frother via the alternate methods described below. What is a london fog drink and where did it originate? London Fog is a hot drink with Earl Grey tea, milk, and a sweetener. It goes by more than a few names — Vancouver Fog, Vanilla Tea Misto, or just Earl Grey tea latte. It apparently originated in Vancouver and is a common drink in Washington and Oregon as well. 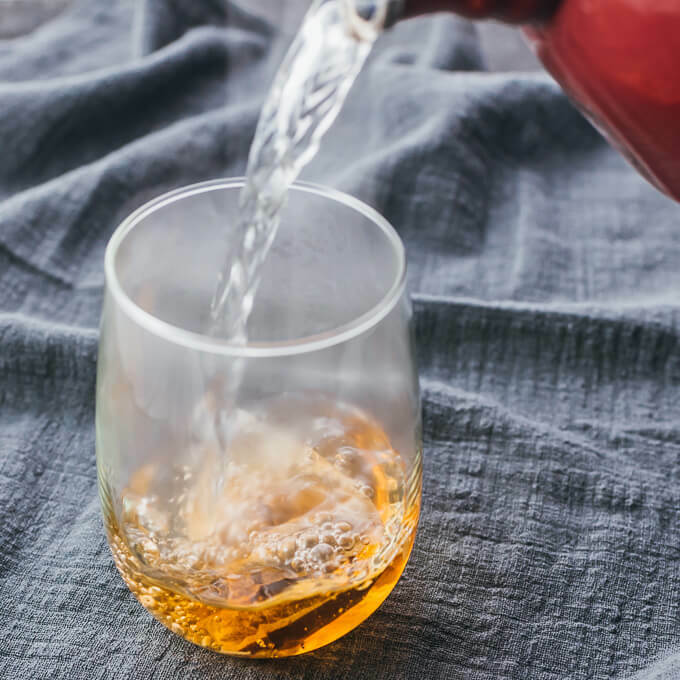 There are many variations on this drink, all with their own names: Calgary Fog that uses maple syrup, Dublin Fog replacing Earl Grey with irish breakfast tea, Maui Fog that uses coconut syrup, and many more variations that use different kinds of tea or syrup. My version of London Fog is the usual Earl Grey tea with milk except I use almond milk to reduce carbs and calories and I avoid vanilla syrup by using a combination of vanilla extract and a low carb sweetener. The result is the same great taste, but healthier. What is in a london fog at starbucks? 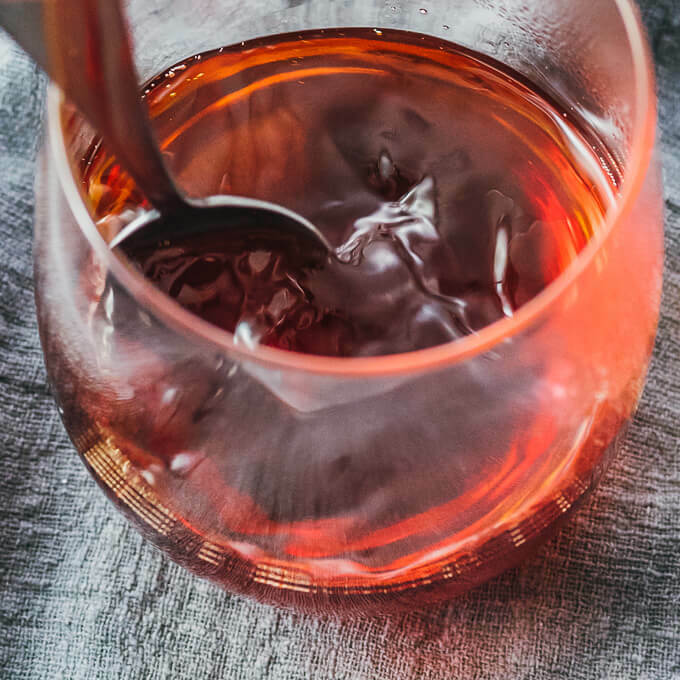 Earl Grey Tea: This is black tea flavored with bergamot oil, which is an essential oil produced by cold pressing the inside of a bergamot orange rind. You can buy this in supermarkets or online, and I don’t recommend substituting with another type of tea when making London Fog. Milk: This can be dairy milk or any kind of nut milk. I typically use unsweetened almond milk that’s flavored with vanilla for a low carb version. Sweetener: Any kind of sweetener can be used, including sugar or sugar alternatives. I use erythritol, which is a low carb, keto friendly sweetener that cannot be digested by the body, so it has no impact on blood glucose and insulin levels. I use the powdered form and not granulated. Vanilla Extract: This gives the vanilla flavor to the drink. You can use vanilla extract or other liquids marketed as vanilla flavoring. Some people use vanilla syrup. How do you make a london fog drink? It’s easy to make a London Fog drink at home. First, steep a bag of Earl Grey tea with hot water for a few minutes or until it reaches a desired strength. While the tea is steeping, froth the milk until foamy and hot. Add vanilla extract and a sweetener to the tea, and then pour the frothed milk on top. Pretty easy, right? 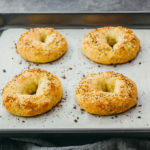 Scroll down to the recipe card below to check out the specific ingredients and amounts that I use. How do you froth milk without a frother? Find a microwave-safe jar that comes with a lid. Add almond milk to the jar and secure the lid. Vigorously shake for a minute or until the milk has increased in volume and is frothy. REmove the lid. Microwave the uncovered milk until hot, about 30 seconds, and the foam will separate from the milk and rise to the top. Use immediately. I’ve tried using both a frothing tool and the shake-and-microwave method, and both work well. The latter doesn’t produce milk that’s as frothy, but it will work well for making London Fog. An easy recipe for London Fog Drink, a tea latte with Earl Grey, milk, vanilla, and sweetener. Add hot water and tea bag to a mug. Steep for a few minutes or until desired strength is reached, then discard the tea bag. While the tea is steeping, froth the almond milk using an expresso steamer attachment or other tool, until foamy and hot. Add sweetener and vanilla extract to the mug, stirring until dissolved. Pour the frothed almond milk on top, spooning the milk foam to top. Serve while hot. 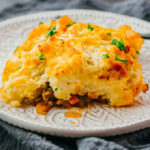 This recipe yields 0.5 g net carbs per serving. Nutrition information assumes erythritol sweetener is used, which cannot be digested by the body. Although I drink a small glass almond or cashew milk (vanilla, unsweetened) every morning, I actually preferred heavy cream as a sub in instead! 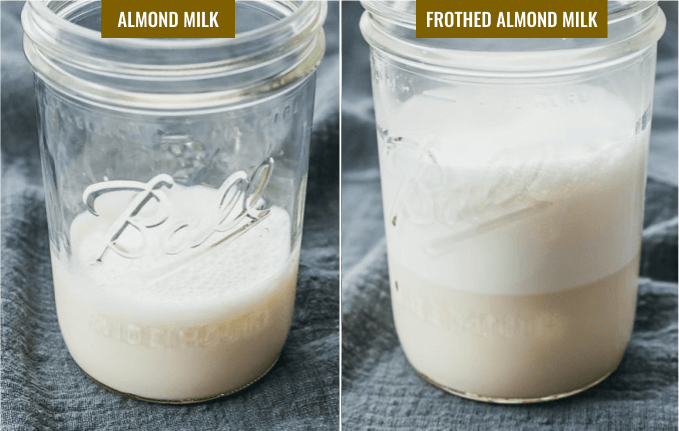 I tried this with the milk alternatives then with heavy cream, and found the heavy cream has the fat to froth well and doesn’t separate when warmed (which my cashew milk definitely did – I don’t recommend that one lol!). 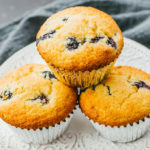 Thank you for the keto-friendly recipe – I have been looking for one without all that syrup and regular milk and happy I came across yours! I can’t wait to try the eggnog! I’ll have to try it with heavy cream next time. Thanks for the suggestion, Carolyn 🙂 And I really recommend the eggnog — I just made a batch last week! Wow, I’ll be making this again soon!